Celebrate Park(ing) Day in our Pop-up Park! NeighborWorks® Rochester’s Healthy Blocks Neighborhood Initiative will provide a temporary public open space – a Pop-up Park – to foster community in a city neighborhood and celebrate Park(ing) Day on September 18th. Park(ing) Day is a world-wide initiative which allows residents, businesses, community organizations, etc. to collaborate and transform a parking space into a temporary public green space. This urban oasis will take place at 1090 Culver Road, Rochester, in the parking lot of Rochester’s only remaining cobblestone structure. This space exists within the Triangle Neighborhood (bordered by Culver, Merchants and Main Streets), which is the focus of NeighborWorks® Rochester’s Health Blocks Neighborhood Initiative. The Park(ing) Day event will allow neighbors and the public to socialize in a relaxing outdoor setting which includes food, drink, history and games. Thanks to Broccolo Tree and Lawn Care who will provide greenery to help make the otherwise empty lot into a Pop-up Park. The event will be held from noon to 6:00 P.M. and will include ice cream from Eat Me Ice Cream and espresso from Ugly Duck Coffee. The first 50 Triangle residents will receive a free affagato – a coffee and ice cream confection. They will also be available, along with ice cream and espresso, for purchase. The Landmark Society of Western New York will also be there to provide historic photos and a history of this unique building, while Reconnect Rochester will provide a mini-golf course and Park(ing) Day bus stop cubes to add to the fun. After a long vacancy, the empty lot at 622 Merchants Road recently became a community garden once again. 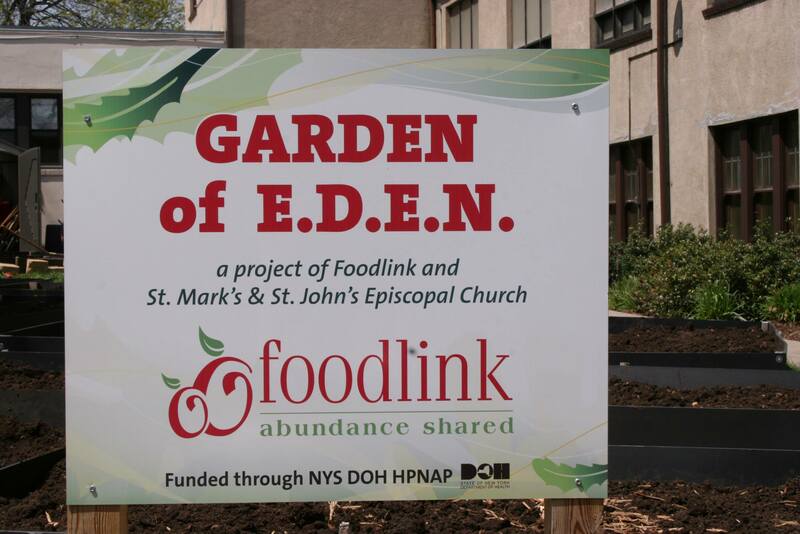 The garden is a result of a partnership between St. Mark’s & St. John’s Episcopal Church, Foodlink, Covenant United Methodist Church, the City of Rcohester and Healthy Blocks. The garden contains 16 raised beds, flower garden, a picnic table and a tool shed in the near future. Our United Way Day of Caring volunteers from Paychex and New Directions helped clear the lot and build the raised beds all in a day! This garden is the church’s second growing site after a very successful initial effort on church property. With the generous donation of materials by Foodlink, a portion of the food produced goes to those in need. Food is distributed locally through various food pantries, including the one found at St. Mark’s & St. John’s. Neighbors are encouraged to participate in the community garden throughout the growing season. Volunteers may join Mike Finn, lead garden coordinator, this Friday at 10am to plant seeds in the raised beds. The garden will have scheduled harvest days where the food is weighed before being distributed. Gardeners also reap some rewards for their efforts by taking fresh produce home with them! Gardening plus several other eco related topics will be featured at “Taste of the Triangle” on May 31st, from 11am-3pm. This event will feature free food tastings from local restaurants, live music, as well as community and “green” resources. The Merchants Road garden coordinators will be at the event ready to chat about the project. For more information about the garden or “Taste of the Triangle,” please send me an e-mail or give me a call: mkraines@nwrochester.org 325-4170 ext. 317.